The South African export season has recently kicked off. After last year's record revenue, volumes will be around 30 to 40% lower this year. The Hass variety is currently being harvested. There was some fruit drop due to the heat wave in October 2018. According to traders, prices are a lot better than last year. "We could have done with some higher volumes, especially since other countries are also struggling with lower productions." Prospects point to prices continuing to rise until the end of May. South African exporters have about a month to have an impact on the situation in the European market. After this, prices are expected to stabilize at better levels than last year. The manager of a warehouse says that the avocados are nice and clean. "In general terms, they look a lot better than last year." Kenya is in the process to start exporting to China soon, but it still has to wait until all administrative transactions have been completed. "Hopefully, this will happen before the end of our season in August." Volumes from Sicily were and are still high. The weather conditions have been unstable this season. From August 2018, it was often cold, so the avocados did not fall prematurely from the trees. At the same time, there was a lot of rain and wind and the trees were exposed to considerable temperature swings. Most avocados are of an average size (26-24-33-20), and there's a small share of size 16-18 (mostly fruit from new trees). All in all, it has been a special year on the avocado market. There was a lot of product available, in particular of the Hass variety. In October, there were sharp prices drops due to the abundant presence of imported products, especially from Peru and Africa. This happened despite the fact that the demand remained higher than the supply. In October 2018, a Sicilian company started exporting avocados to China for the catering sector. Those avocados are shipped by plane. They depart from Segrate-Milan and arrive in Hong Kong. The feedback so far has been positive and orders have already quadrupled. The producer is already growing the fruit on an area of ​​110 hectares and is planning to expand this acreage by another 30 hectares. Within two seasons, new plantings should ensure an extension of the Sicilian avocado season, which will last from October to June. A company from Apulia will start planting 40 hectares in April. “We expect to plant around 32,000 trees (800 per hectare). These are mainly of the Hass variety, but we will also plant some Ettinger, Pinkerton, B.L. and Reed varieties. This will ensure availability from November to May.” An antifreeze system is being set up to protect the trees against the winter cold. The Spanish avocado season will end in about a month and a half. In January and February, the market was slow due to the abundant supply from other countries. This led to a delay of up to twenty days in the harvest and sale. Sales have been going well since March. "The supply from Chile, Mexico and Colombia is declining in Europe and the demand remains high. Spain is taking advantage from this. We are now marketing everything that we were unable to sell in January and February. March is our avocado month," says an exporter. According to him, the prices are currently adjusted to the supply. "The growers' prices oscillate between € 2.50 and € 3.00 per kilo, depending on the sizes. The price for a four kilo box ranges between € 12.00 and € 14.50. A few weeks ago, many growers found the prices insufficient. Those who have waited and started harvesting later are now seeing good results," he says. In the first week of April, the importer-exporter will start importing avocados from Peru, Kenya and South Africa. Last year, there were some difficult moments in the period between spring and summer due to the large Peruvian harvest, which caused the volume available to be almost twice greater than the market could handle. "Peruvian exporters always announce a smaller harvest than they actually have to try keeping prices high. This year, the Peruvian harvest started later, and given the harvest of new plantations, there may be more production available than last year," says the exporter. 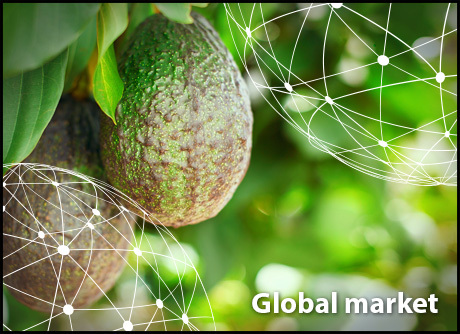 Although the avocado supply continues to grow worldwide, the high demand and the fact that the fruit is becoming a basic product, according to the exporter, ensure that prices remain profitable. "In recent years, the avocado industry has experienced a boom. Prices per box have gone up to as much as 18 Euro, as there have always been shortages due to the huge demand. Prices of 11 to 12 Euro per box are already profitable for all links in the chain." "After a number of years with such high prices, the avocado sector has attracted many entrepreneurs who have little knowledge about the product," warns the exporter. The acreage is expanding in Spanish provinces like Valencia, Huelva and Cadiz, which have traditionally been citrus growing areas." Dutch importers say that the sale of both Greenskins and Hass avocados is currently going well. Volumes from Israel have declined due to the end of the season, but the sale of Fuerte from Peru and South Africa is going very well, with high prices reaching 9 to 9.50 Euro. The first Hass avocados from Peru and South Africa are expected in the first week of April. South Africa started earlier than usual this year. After the huge amounts of Hass avocados shipped by Peru and South Africa last year, the prospect now is that there will be 30% fewer Hass avocados coming from South Africa. Peru expects to ship its usual volume. The situation in the German avocado market is currently very stable, with continuous availability, relatively good prices and good product quality. The majority of Hass avocados come from Peru and Chile and are supplied in ready-to-eat quality. In the German wholesale market, the prices per box (16 pieces) fluctuate around the 13 Euro. Importers and wholesalers confirm that the consumption of exotics, including avocados, is still on the rise. Although Hass avocados are still by far the most important, other varieties are gradually gaining ground. The Greenskin avocados and the Canary varieties (under the brand name Sigfrido) are imported on a relatively small scale. Ethiopian organic avocados, including the Fuerte, Ettinger, Pinkerton and Nabal varieties, have recently also become available in the premium segment. The avocado market is currently in a transitional period. The Chilean season is over and the Peruvian campaign is slowly starting up. Prices are on the high side, but not as high as at this same time last year. There is still some uncertainty about the volume coming from Peru, but it is said that it may drop by 10 to 15 percent compared to last year. Since the French avocado market is now in a transitional period, there is fruit from just about all origins available. “Spain, Israel, Chile, Mexico, Kenya, Peru, South Africa and Brazil are all present on the market, but with small volumes. They are all either at the beginning or at the end of their campaigns," says a wholesaler. “This could lead to a shortage on the market at Easter. The demand is high, partly also because supermarkets are planning to organize fun promotional campaigns. What could further complicate the situation is that in many Spanish-speaking countries, people hardly work during the Easter week. This could cause a temporary paralysis of imports that would push prices up." The avocado market is a developing one in China. The import volume continues to increase every year and the most important suppliers are Mexico, Chile and Peru. A fourth country may be added soon: Kenya. Last year, the Kenyan and Chinese governments reached an agreement for the export of Kenyan avocados to China. However, not all export procedures have been finalized yet, so nothing can be imported yet. This week, a Chinese delegation will fly to Kenya to conduct inspections on the avocado fields and to check how the fruit and vegetable inspections are carried out at the airport. The prospect is that after this inspection, exports will start very soon, but that cannot be said with certainty, because such procedures always take time. In any case, there is a high demand from Chinese importers for Kenyan avocados. In China, producers are also working hard to obtain a domestic avocado production. Yunnan and Hainan are two important places for this, although things are still in the initial stages. There is still a lot of on-going research to find out which varieties can do well on Chinese soil. Over the past decade, the Australian avocado production has grown by around 7% annually. Still relatively few avocados are shipped overseas, but this will change if the sector reaches a production of around 115,000 tons per year by 2025. In the season that ran until June 2018, 77,032 tons were produced. This was an increase of 17% compared to the previous one. The total value increased by 45% to $ 543 million. At the same time, exports decreased by 23%, to 1,786 tons. As a result, the value fell by 11.6%. Australia has two avocado seasons for different varieties. The Hass is by far the most commonly grown, accounting for 78% of the total production and is available almost all year round. The season peaks in March. Another 20% of Australian avocados are of the Shepard variety. This has a relatively short season that runs from late summer to autumn. In New Zealand, the international popularity of avocados is leading to greater investment in the industry. More growers are buying avocado orchards or expanding existing ones. The return has improved in recent years and the prospects for the coming years are good. There is a good supply of greenskins in the southeast coast. “The Florida greenskins market is good. We have a late variety, the Buck, which can remain on the trees longer than most other varieties. As a result, it has a higher oil content," says a trader. “We are currently harvesting the Bucks. It is a delicious avocado and there is a lot of demand for it in South Florida.” The market for greenskins is really good in Florida. Many avocados from the Dominican Republic are traded across the country. This mainly concerns the Carla and Beneke varieties. The Carla does not differ much in terms of properties from the Buck, while the Beneke is a more typical greenskin. The latter has a smoother texture, a lower oil percentage and turns red-black as it ripens. The supply of the Carla and Beneke is still good at the moment, although it is expected to fall until the Florida season starts on May 15. “The Dominican volumes are always decreasing around this time of the year. This season, the volumes have been smaller than last year, in any case. In some growing regions in Florida, the yield of the Carla will be lower than in previous years. The Beneke harvest is expected to be an average one." The trader expects the Florida harvest in the 2019-2020 season to be similar to that of early 2017, before the hurricane hit the area in September 2017. “In 2018, the trees in Florida regained strength. There was noteworthy vegetative growth, and the early varieties in particular had a low yield.” Last season's prices for greenskins were about 15% lower than last year, mainly due to the large volume of Hass avocado imports.